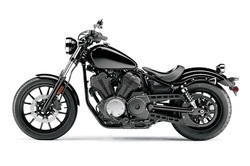 The Yamaha XVS95CE "Bolt" is equipped with an ECU (Electronic Control Unit) that has both an on-board self-diagnostic function as well as the capability to connect the Yamaha Diagnostic Tool, in order to ensure that the bike is operating normally. Having said that, there are and will be many cases where there will be no indication of a fault on the Multi-Function Meter's LCD Display. In which case, you will need to troubleshoot and isolate the symptom causing your problem. Of course, there is no way possible to have a "perfect", all inclusive troubleshooting "tree", which bores down to each and every symptom possible. But, by following the on screen guides, hopefully you will be able to either resolve your issue or get close enough to where, you figure out what the symptom is and be able to address the issue and get your bike back on the road. Is there a "Fault Code" indicated on your Multi-Function Meter's LCD Display?